Today we pause from our whirlwind of a life to reflect and give thanks to the many wonderful friends, family and animals that surround us every day. It’s also a time to be grateful for the luxuries and securities that we have an to never take any of our material privileges for granted! Mamma Biscuit has so much to be thankful for in 2014. 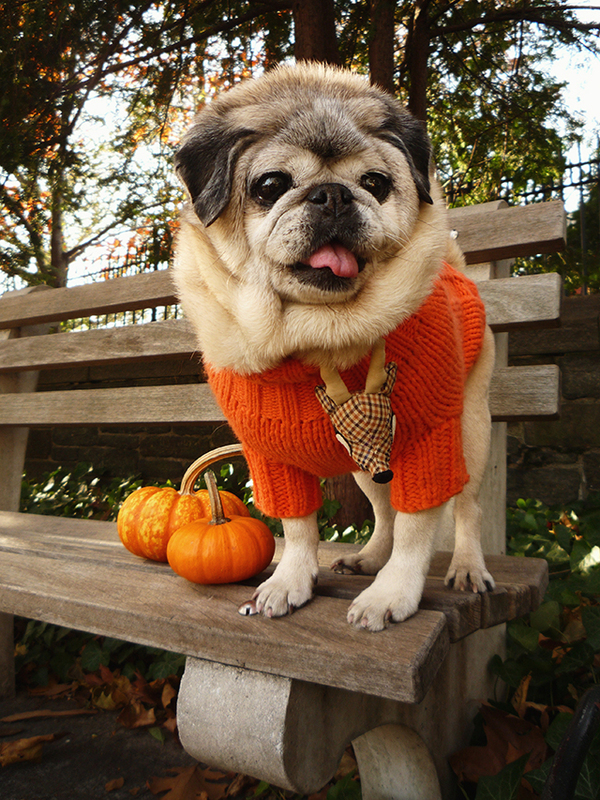 Aside from the fact that she is 14 years old and still has the spirit, health and energy of a puppy, she’s also incredibly grateful for the fabulous wardrobe she has amassed in the six years she’s been with us—and her outfit today is a testament to just how flawless her Autumnal style really is. 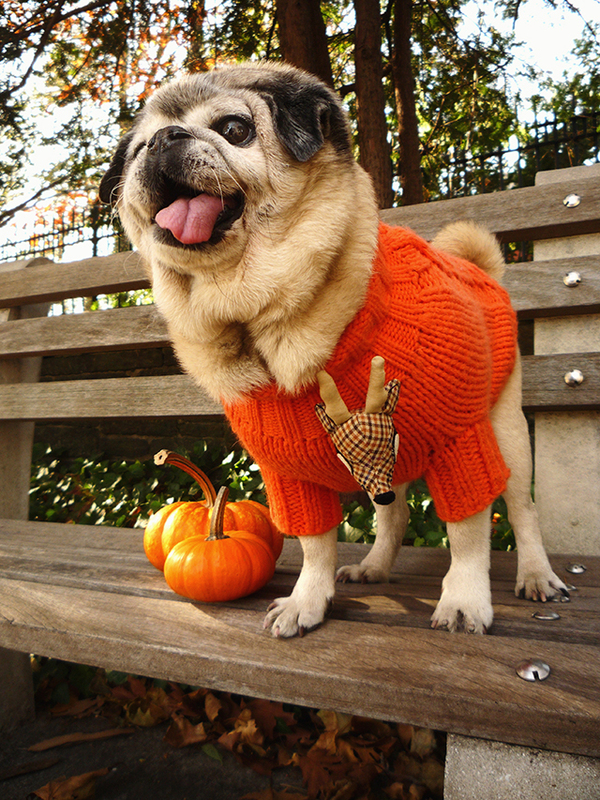 No other pug can work a two-pumpkin-park-bench-set quite like our little gremlin—and no other pug ever will. The Biscuit Lady is also very thankful for the plethora of yummy peanut butter treats she gets every single day just for being so damn adorable. Most of all, she’s thankful for having two loving daddies who practically worship her and go through great lengths to provide a pampered life she deserves. So in the spirit of being thankful and actually applying it to our lives, Mamma Biscuit has decided to change Thanksgiving to Thanksliving—because in our opinion, appreciating what we have while we have it is what can cultivate true happiness in our lives. Having Mamma Biscuit in my circle-game of life has truly made me reflective about her life, her horrible past and of course, our lives before this beautiful creature became the lady of our home. I have a mini thanksliving holiday in my head every day of the year when I look into her eyes—and what eyes she has! 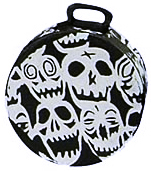 Big, wet, expressive marble eyes that can either endear or stare down even the toughest kitchen-keeper around. Just knowing that this beautiful creature is all mine, ready to give and receive love is what brings true comfort and joy in my own life! So the Lady of our house has been pacing back and forth throughout the Pug Palace working her nose into a frenzy. She throws her nose in the air at every corner, sniffing the scent of baked goods wafting from the oven in our kitchen. She knows the drill. The days get shorter, the air becomes crisp and cold and before she knows it, that day of over-eating followed by a visit with Santa Claus on Black Friday has arrived! On a side note, Thanksgiving to me has always been a road block between Halloween and Christmas. I know it may sound harsh but aside from the actual meaning of giving thanks, the rest of the holiday revolves around food and whether or not I can control my growing waistline! Of course Mamma Biscuit loves Thanksgiving for the exact reasons why the holiday gives me anxiety—FOOD! 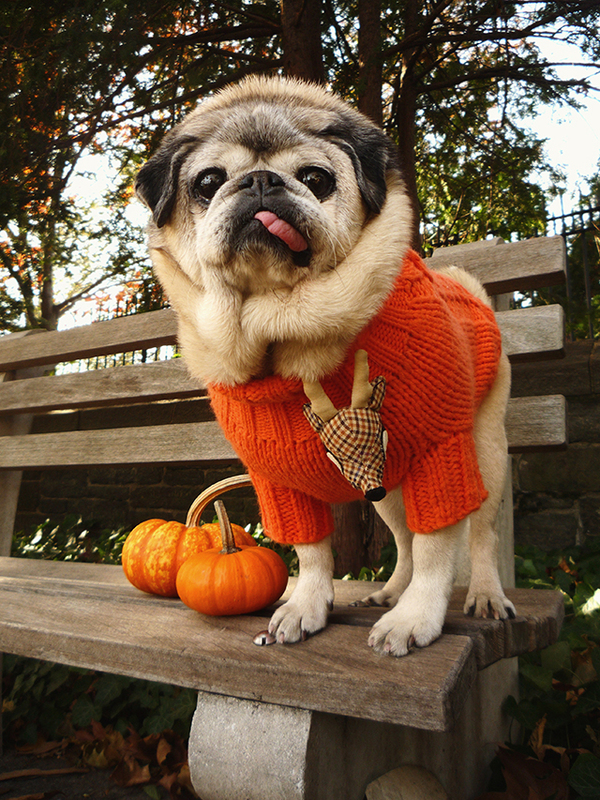 So to calm the Biscuit Lady down from the impending feast, I thought it would be a great idea to throw her into her finest knitted sweater, grab a couple of table pumpkins and head out to the park to take a few Autumnal portraits to commemorate Thanksliving, 2014. Doesn’t she look absolutely stunning in this shade of orange? 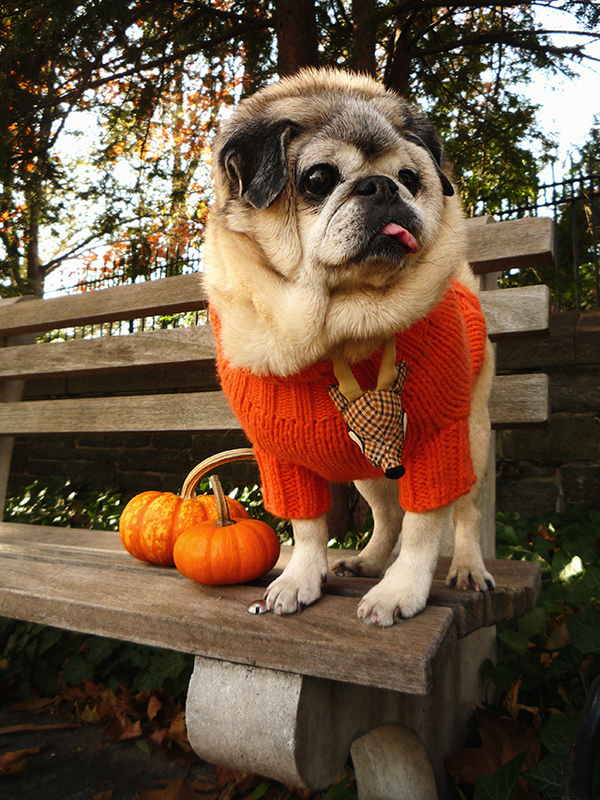 The crowds spilling out of Fort Tryon Park could not handle how cute Mamma Biscuit looked perched upon this bench and of course, being the consummate professional that she is, she always gives 150% back to her fans. Getting Mamma out of the house for an hour or so was the least I could do to give Tommy a chance to bake for the holiday without having a pug shadow at his feet. Our pug can be quite the bully in the kitchen, barking at the drop of a crumb! At any rate, I’m always happy when I can capture our gremlin in her element through photography. Expressing true gratefulness is difficult in one day, for grateful deeds span throughout the year, however, the abundance of joy and love that Mamma Biscuit brings to us everyday allows us to feel the gratitude we feel most on this very day—all year long. May you all enjoy a delicious meal with your loved ones—Mamma will sure be feasting on some Tofurkey during ours! 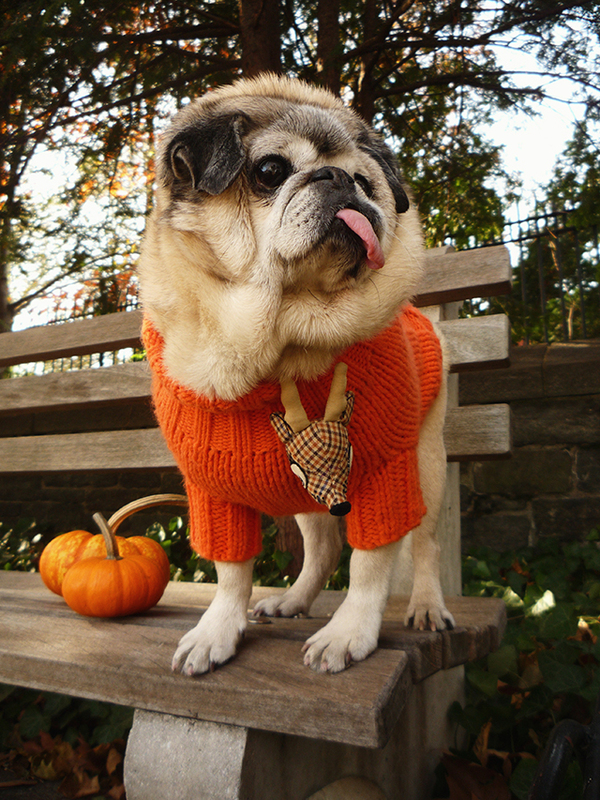 This entry was posted in Fashion, Holiday, Knitware, Portraits. Bookmark the permalink. 4 Responses to Giving Thanks, 2014! Happy Thanksgiving Biscuit family! 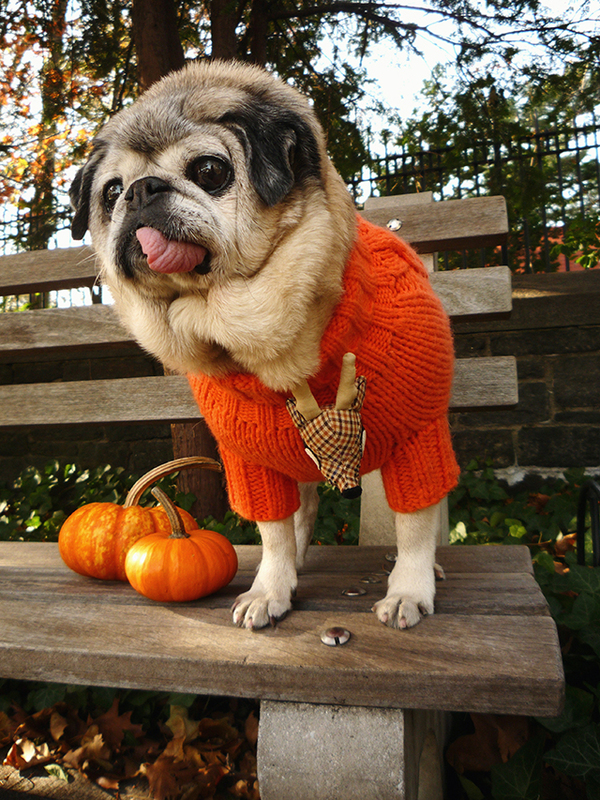 That was a beautiful post in gratitude of Mamma Biscuit, who looks like a little pumpkin perched atop her bench. Orange is her color. I am certain Mamma is as thankful for her two dads as they are of her. It is funny to hear someone else say that Thanksgiving is the roadblock between Halloween and Christmas (I always called it the “hump” holiday between the three). We are also very familiar with pug bullies in the kitchen. 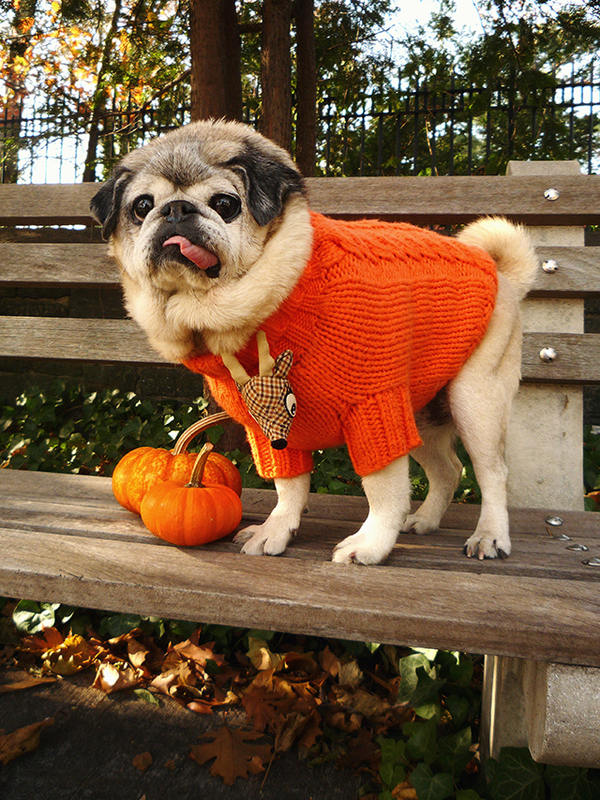 Ramona, Dieter and Winston’s little pug noses are a twitter with the scent of pumpkin bourbon creme pies and anise drop cookies. 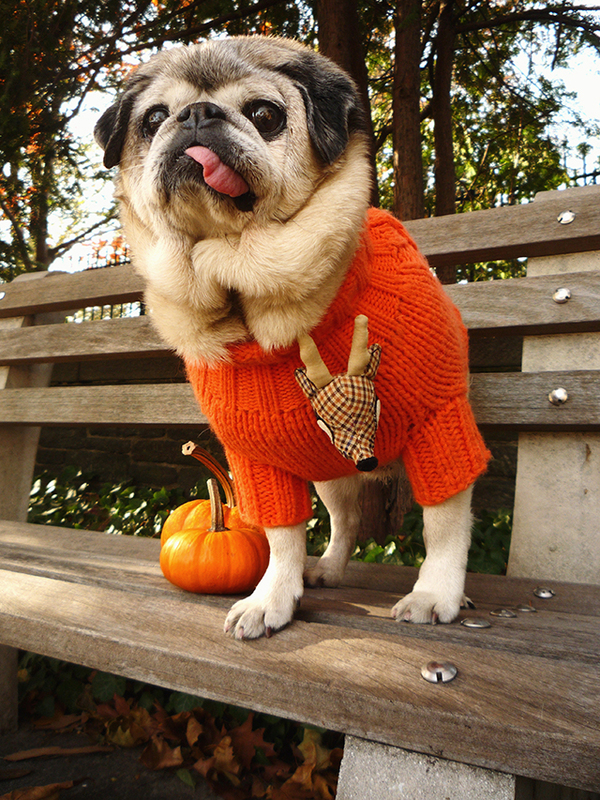 Enjoy your Thanksgiving Biscuit Family and Happy Black Friday, Pugs and Kisses, Christine and the Pug Pack. OMG “pumpkin bourbon creme pies and anise drop cookies” now my stomach is grumbling like Mamma Biscuit’s! If that’s what you have in store for dessert then we’re coming over! 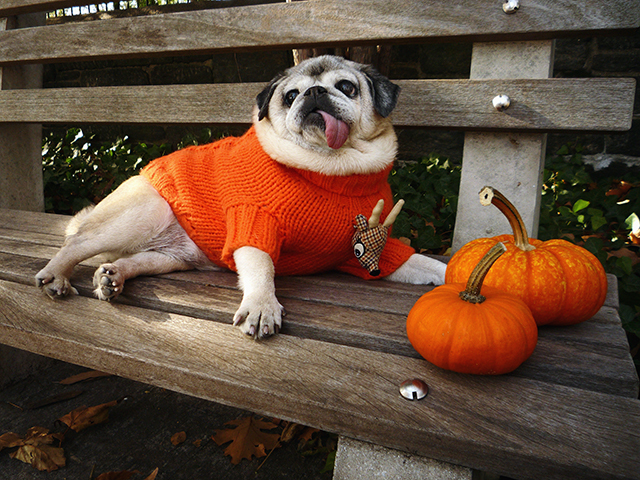 ;-) A very Happy Thanksgiving to you and the pug gang as well! 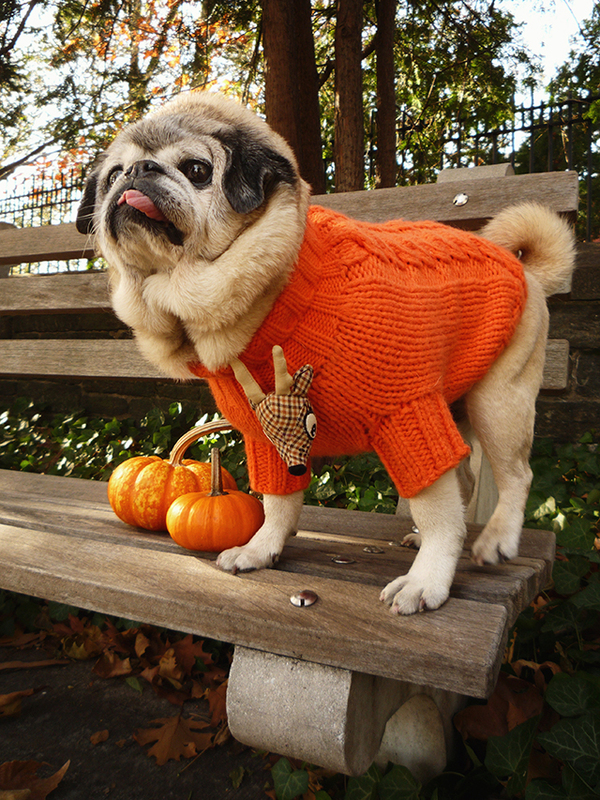 Enjoy your feast and give your pugs many hugs and kisses! I also have to laugh, as this year we learned Eddie will actually TABLE DANCE for turkey, but Penelope pug bottom is much more of a stuffing fan. Either way, it’s been a somewhat complicated dance of keeping one pup or another away from certain courses. Mamma is a lovely lady, and I know she must enjoy meeting Santa a whole lot more than that freakish, trippy Bunny character last spring. Hell, I’m still having nightmares from the photos. OMG, I’m so sorry for getting back to you guys so late! We hope you had a fantastic Thanksgiving holiday but most of all, we hope Penny and the gang had more than their fair share of treats to celebrate! Mamma’s Santa photos are up, we hope you like them!